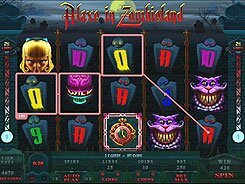 Four bonus games, two wild symbols, a 3000-coin jackpot, and a host of creepy symbols. 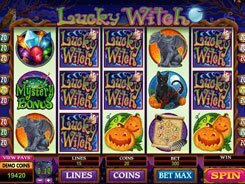 . . Lucky Witch from Microgaming is an action-packed Halloween-themed slot with attention to detail and top-notch animations. 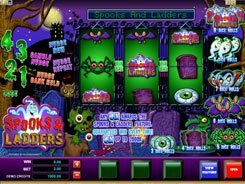 Played over 5 reels and 15 lines, the slot features potions, cauldrons, black cats, owls, gargoyles and all that magical and spooky stuff associated with Halloween. A coin value can be adjusted from $0.01 to $0.20. 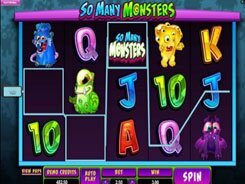 The slot accepts up to 20 coins per line, so the minimum and maximum wagers are $0.01 and $40. 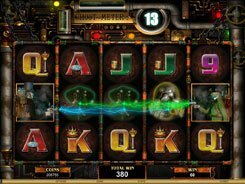 Along with wilds, stacked wilds, scatters and 13 free spins, the slot features 4 bonus games. When rolling in the Mystery Bonus symbol on reels 1, 3 and 5 at a time, you unlock the Mystery Bonus that awards you any of the four different bonus features: Magic Potion bonus, Pumpkin bonus, Secret Vault bonus or Spell Book bonus. Whichever you get, generous cash prizes are guaranteed. 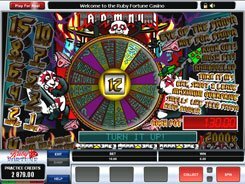 If you appreciate the quality of Microgaming slots, then this feature-stuffed game is a must play.